I opened my front door the other day to find some rhubarb, already trimmed and tied with a bow. I put out the rubbish, brought in the rhubarb – not a bad swap, I think. If only it worked like that every time… Not only do my neighbours have a beautiful garden which puts mine to shame, not just pretty but also with plenty of fruit and vegetables hidden away at the bottom, they also have an allotment. And I am the very fortunate recipient of some of their produce. When I moved in last summer they gave me heaps of home grown green beans; such a lovely welcome present. How lucky to be given rhubarb by my neighbours! 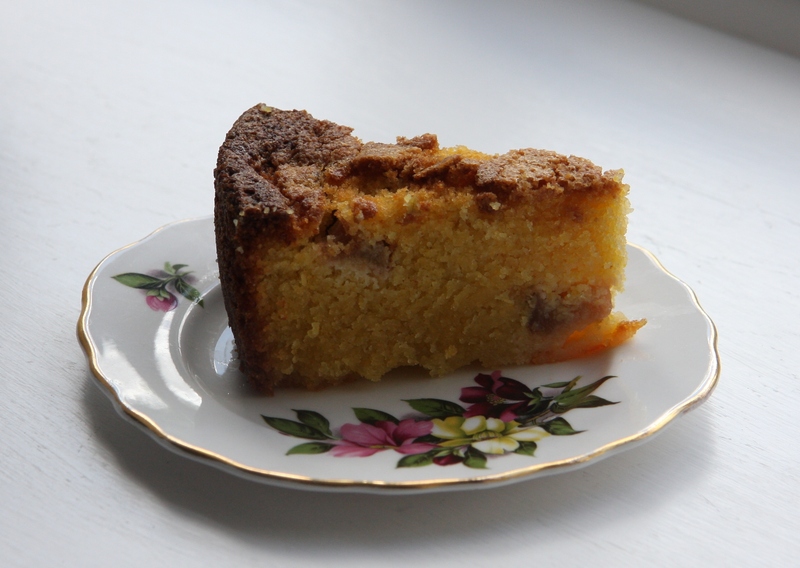 I thought it would be a good idea to use the rhubarb to make something I could also give back to them, and polenta cakes are high on my list of cakes to make at the moment. So I made two of these: one for us (for control purposes, of course) and one for them. Getting them out of the tins was a bit of an issue but I am hoping to avoid the same problem next time. One of my deep 8″ tins does not have a removable base but I thought I could get round this by lining the sides as well as the base with greaseproof paper. 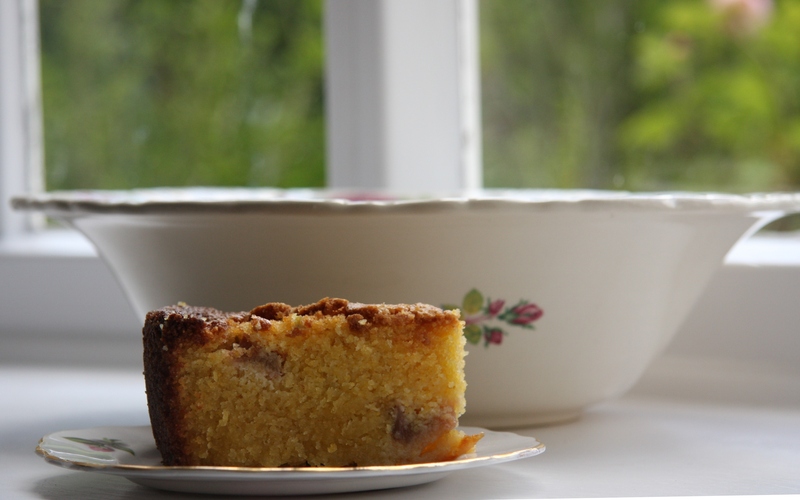 Being gluten-free, this cake was always going to be tricky to get out of the tin without it crumbling, but I thought the rhubarb might help with that. It probably does make it less crumbly but the sugar and the rhubarb also combine and get very sticky on the base – greaseproof paper is a bad idea as a liner for this cake as the jammy rhubarb sticks to the paper – just make sure you use baking parchment instead! Next time I will also try adding a teaspoon of xanthan gum to help reduce the crumbling: if you really don’t want it to crumble and don’t need it to be gluten-free, just use plain flour instead. 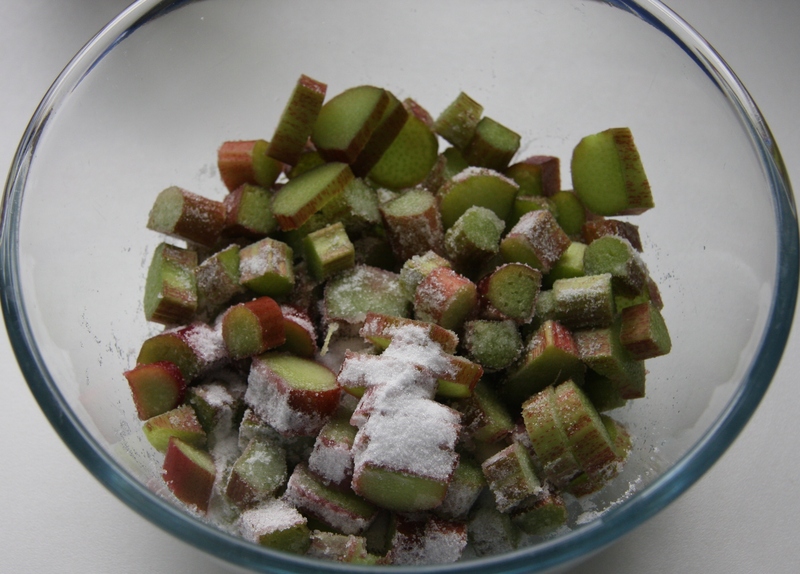 Chop the rhubarb and put in a bowl. Sprinkle over 50g sugar and mix well. Leave for at least half an hour. 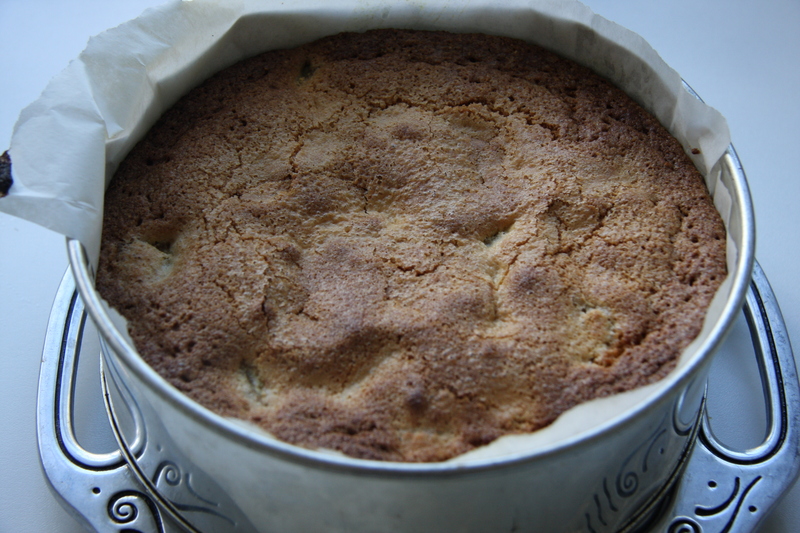 Set the oven to 180ºC and line the base and side of an 8″ deep-sided, loose-based cake tin with baking parchment. Beat the remaining sugar and the butter until it is pale and fluffy. 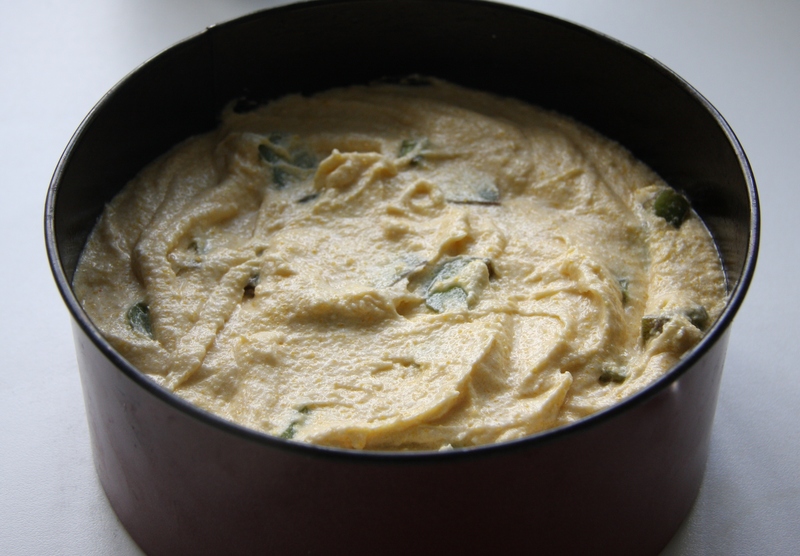 Add the almond flour, polenta and xanthan gum if you are using it, and fold in. Pour off the liquid from the rhubarb and then mix the rhubarb into the cake mixture. You can, if you wish, boil the remaining rhubarb flavoured sugar solution and turn it into a syrup to serve with the cake. Pour into the prepared tin and level gently. Bake for around one hour, checking after about 40 minutes. If the cake is browning too quickly cover it with foil. The cake will be well browned and firm to the touch when it is ready. A skewer inserted into the middle should come out without any cake mixture sticking to it. Allow to cool in the tin for at least half an hour before carefully removing from the tin and leaving to cool completely on a wire rack. Use a loose-based tin and parchment paper! This makes a great cake with a cup of tea or coffee but also a delicious dessert, warm with ice cream or crème fraîche. Thank you Jackie and Les! I was just talking about how I miss cake so much since going gluten-free – perfect timing! If I have a removable bottom cake pan (angel food pan?) then do you still suggest the parchment? This looks soooo tasty! I would definitely use baking parchment, it will make it a lot easier to get out of the pan. Let me know if you make it! Thank you – I’m very lucky with my neighbours! ooh yum! the other day I just made an upside down strawberry and rhubarb cake.. rhubarb is definitely very lovely in cake..and what lovely neighbours you have! Looks delicious! If I can’t get almond flour could I use gluten free plain flour instead? Yes, definitely (almond flour is just ground almonds). Hope you enjoy it! Oh right. Didn’t realise that. Thank you. Don’t worry, it took me forever to work that out!